Do you have an old, broken or wrecked Nissan vehicle? Are you looking forward to sell it for quick cash? Then you will want a reliable option that doesn’t involve much trouble and stress related to the process. Nissan is truly a recognized brand name in the Japanese industry. Since it has produced some of the most innovative and stylish models. On the dark side, when it comes to an end of life age vehicle. It always leaves the best value in the hand on its owners. And, thanks to the Sydney’s most wrecking outfit – “Wreck Monster”. With their help any car owners can get rid of their junk, smashed and damaged automobile that is not running anymore. Not only this, we are always happy to shell out the most handsome cash for all models of Nissan. At our best, we pay top dollars up to $15,000 for Nissan cars, vans, Utes, SUVs, trucks, 4WDs and other commercial vehicles. However, the condition of your wheels helps us in determining a precise cash offer for it. Whether you have an old or wrecked Nissan automobile lurking your garage, driveway or yard. We will provide you fairly reliable cash for car services for it so you can get rid of it preferably as fast as possible. Fortunately, we here at Wreck Monster have a great many years of experience in the business of buying and wrecking scrap automobiles. Thus, we pay top-notch money for nearly all makes and models of Nissan. With more than 25 years of knowledge in this field, we are recognized for offering the most convenient and hassle-free towing services throughout Sydney. In addition, we are always paying a fair cash for all sizes and shapes of Nissan no matter what the damage is. Furthermore, our passionate wrecking crew like to purchase all major models of Nissan. It could be indeed any stylish Nissan model like Atlas, Figaro, Bluebird, Serena, Auster, Cube, Sentra, Cherry, Rogue, Clipper, Altima, Cube, Safari, Fuga, Primera, Navara, Terrano, Almera, Tiida, Pulsar, Silvia, Maxima and much more. Check out the full list of Nissan vehicles we wreck. 100% Customer satisfaction matters the most! Throughout the process of selling a vehicle, every owner wish to deal with as less trouble as possible. This is why, most of the people avoid dealing with private buyers and auto dealers. But the professional Wreck Monster team considers customer satisfaction as their top priority. We are always happy to satisfy the car removal and scrap auto wrecking needs of all the residents of Sydney. Our efficient staff will take the responsibility of all the tough chores related to the sale process. This includes organizing all the related paperwork and hauling away the automobiles for free. Therefore, when you choose our convenient services, you don’t need to worry about anything involved in the sale process. You don’t even need to worry about the make, model, year and condition of your old vehicle. As we will buy any Nissan make for the highest cash with 100% assurance. Also, we are a professional and skilled auto removal company. As such we take care to use advance resources, tow trucks, and other equipment’s in order to meet the required safety standards. Please use any of our easy numbers today and obtain free cash estimation for your vehicle today. In addition to availing easy removal and pickup service to all regions of Sydney we don’t charge any additional hidden costs. This means you will not experience any sleepless night and headache when you allow us to remove your wheels. The car removalists here at Wreck Monster are highly responsive and knowledgeable at safely towing all types of small and large vehicles. Basically, we can pick up your automobile from anywhere in Sydney and its closer areas. No matter whether your automobile is running or non-running we will remove it on the same day when you accept our quote. All that you need to do is pick your phone give us a call and discuss your auto removal needs with our representative. You will need to give a brief description of your vehicle. This will generally include details about its make, model, year and condition. Furthermore, you can also hop on to our website and fill out our “get a quote” form, if you want to experience a more easy process. One of our friendly customer care executive will soon give you a fair cash quote. However, if you have some price figures in your mind, then please let us know. If it is genuine, we won’t let you down. 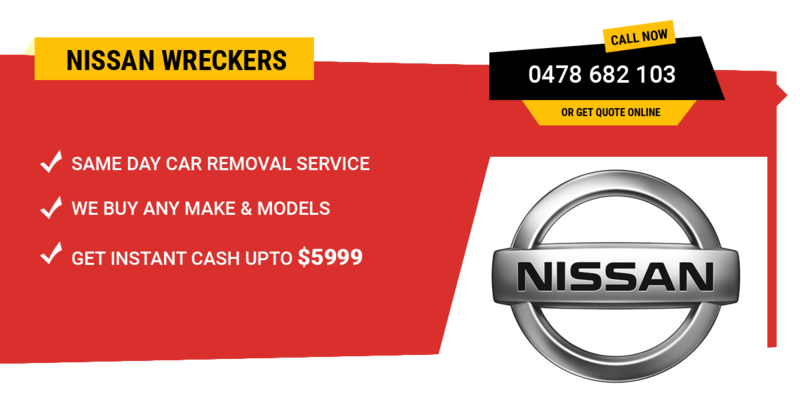 “Wreckmonster” is Sydney’s local and highly reputable old car cash buying company. For this reason we have great experience in delivering quick Nissan removal services across all regions in Sydney. Some of the suburbs that where we often facilitate our smooth removal services are Richmond, Blacktown, Greenacre, Liverpool, Penrith, Parramatta, Ultimo and Baulkham Hills. The Wreck monster crew is extremely passionate about helping unwanted vehicle owners in Sydney. We have Authorized treatment facility license (ATF) and follow green techniques. That’s why, we always work hard to eliminate scrap automobiles that pollute environment. Thus, you can depend on us for proper disposal of your Nissan automobile in an environmentally sound way. Once the automobile gets decommissioned we remove all the toxic fluids and substances from it. These are then disposed to help of most safe methods. Whereas the parts that can be reused further are cleaned and reconditioned to be used in working vehicles. Are you in need of a replacement part to repair your automobile? Then, get access to our wide inventory of used parts and you can again enjoy convenient rides. In our yard, you will get top-notch and pre-checked second hand parts for all Nissan models. The best thing is, we offer parts at discounted rates and with warranty. However, we charge some freight charge when delivering parts at our client’s door.